This entry was posted in Uncategorized and tagged 2012 Election, Conservatism, Obama by Kirk Petersen. Bookmark the permalink. 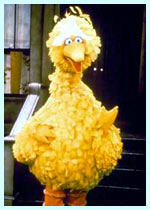 Big Bird is a national treasure, nobody questions that. Some of the people who you slander as “the ignorant gun-toting Right” are no doubt contributors to NPR.